Blessed Lorenzo Maria of St. Francis Xavier (Salvi) was born in Rome on October 30, 1782. He professed the Passionist Rule on November 20, 1802 at the age of 20 and entered the priesthood on December 29,1805. He followed closely in the footsteps of the founder of the Passionists, St. Paul of the Cross. His principle apostolate was that of an itinerant preacher and missionary, but he also gained the reputation of a most wise and admired superior for his ability to ably lead communities. 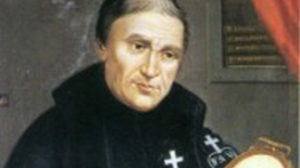 Blessed Lorenzo was steadfast in promoting, in every circumstance, prayerful devotion to the holy childhood of Jesus, not only through his untiring work, but also through his constant example and his proliferation of writings. He was called home to heaven in 1856 in Capranica (Viterbo) and was beatified by Pope John Paul II on October 1, 1989. He is buried in the Passionist church of St. Angelo, Vetralla (Viterbo). Error: Error validating access token: Session has expired on Monday, 18-Mar-19 14:16:37 PDT. The current time is Thursday, 18-Apr-19 19:47:09 PDT.